Caption: On April 11, 2018 Stephen and Kelsey delivered a letter to the manager of a Circle K outlet near the campus of the University of Louisville in Kentucky. Today April 11, 2018 marks two days after the date of the brutal 2007 assassination of Farm Labor Organizing Committee (FLOC) staffer Santiago Rafael Cruz in the FLOC office in Monterrey, Mexico. 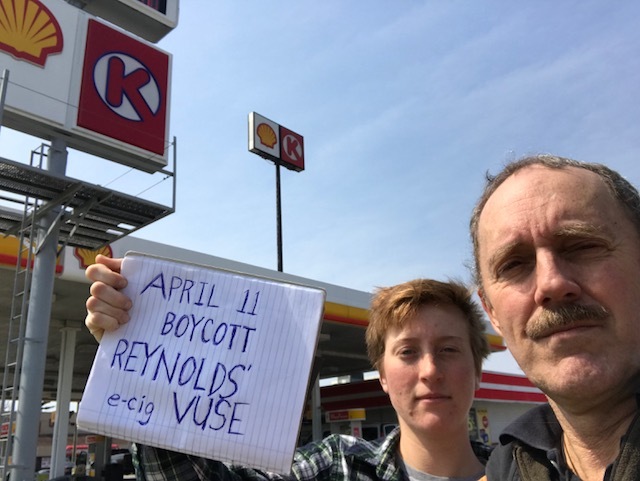 This week FLOC is launching a boycott of the prized e-cigarette product of Reynolds American Tobacco, the ” VUSE” until Reynolds Tobacco signs an agreement with FLOC guaranteeing the right of farmworkers to organize without retaliation and bringing better pay to family farmers and farm workers stressed by excessive toil and low incomes. KY Field Organizer and an ally made a visit to a local Circle K gas station/convenience store on Arthur Street in Louisville, KY to let them know that in the weeks to come we would be picketing this store until Circle K agrees to remove the VUSE e-cigarette from their shelves. Store manager Antonio informed us that he has zero authority over what products are sold in his store and agreed to scan the letter we handed to him explaining the boycott and to send it to the corporate higher ups. We told Antonio, a friendly African American man, and his colleagues, friendly African American women, that the pickets to come at this Circle K store are not aimed at them, but at their corporate bosses, and thanked him for sending the message to corporate. La lucha sigue sigue… Viva the struggle for worker rights for farm workers in the tobacco supply chain!! ¡¡Viva! !